The rock band called "Heavy Metal Rock Band" is on the South-East or "shady" side of the canyon to the right of "Corner Crags". Park at "Sinks Canyon Campground" N 42o 44' 12.3'' - W 108o 50' 11.9'' CEX001 (this campground is near the main wall parking area), follow sign to "Moose Gulch Loop". Soon a trail merges on the right, go strait. At the first fork in the trail make a right. At the second fork ( N 42o 44' 5.6'' - W 108o 49' 50.5'' CEX002 ) make a left and walk 30 meters, step off the trail and bush walk heading 100 o true towards the yellow right side of the rock band. Cross a gully and follow steep game trails to N 42o 44' 3.7'' - W 108o 49' 32.4'' CEX003 . 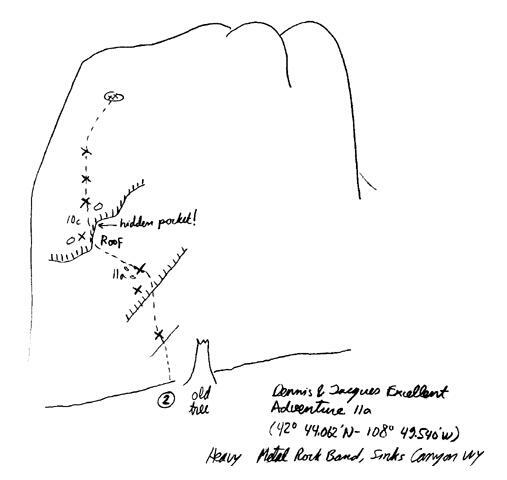 2) Dennis and Jacques Excellent Adventure, 11a 7 bolts plus anchors is about 150 meters to the left along the wall. 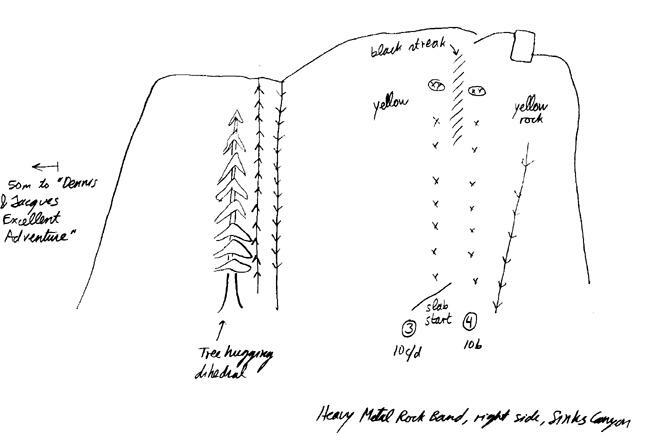 The route is 50 meters to the left of the large tree hugging a dihedral. This route was first climbed by Dennis Vandenbos and the author in July 1997. 3) 10c/d 7 bolts plus anchors, opened by Dennis Vandenbos and friends. 4) 10b, 7 bolts plus anchors, opened by Dennis Vandenbos and friends.